Diversity are a dance troupe from London who rose to fame after winning the third series of Britain’s Got Talent, beating Susan Boyle. The members range in age from 14 to 27 and their varying ages and backgrounds inspired their name. The group is led and choreographed by Ashley Banjo, who was praised for his work on Diversity routines by the judges throughout the show. There are three sets of brothers and four other members, some of whom are still studying at school and university. They performed at The Royal Variety Show in front of the Queen as the prize for winning Britain’s Got Talent, and went on to win a Pride of Britain award. 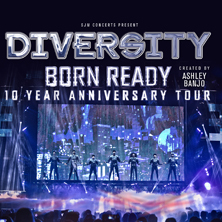 For an exhilarating and magical live show, get your Diversity tickets here!